live music reviews, bluegrass, Americana, mountains, etc. 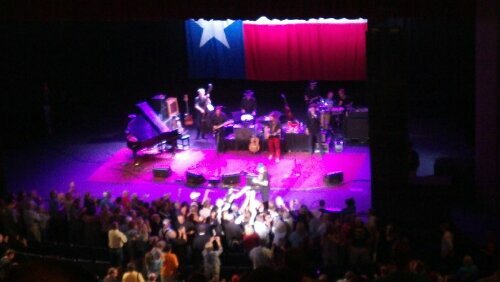 Willie Nelson greets fans at the front of the stage. He’s a legend, plain and simple. On his favorite beaten up old guitar, Willie Nelson played many of his tried and true tunes to an appreciative Roanoke audience: Whisky River, Crazy, Mama Don’t let your Babies Grow up to be Cowboys, Good Hearted Woman, Hey Good Lookin’, Movin’ on Over, South of the Border, Star Dust. Everyone in the crowd knew most of the words and sang along. I love to hear his simple clear versions of Crazy, Georgia and Always on My Mind. Wow, so awesome to hear him play these songs. We saw him several years ago at the Salem Civic Center. He’s 80 now and he’s still touring but you have to take the chance to hear him when you can! He also played the City of New Orleans, To All The Girls I’ve Loved and Roll Me Up and Smoke Me When I Die. He closed the show with a rousing version of I Saw the Light. After he finished singing, the band kept playing the crowd sang as Willie crossed the front of the stage to shake hands with fans and sign autographs. His son Lukas Nelson opened for him and his voice sounds just like a young Willie. No denying that DNA. He’s more of a rocker—at one point he played his guitar with his teeth. That was too much for me but he did do a sweet cover of Something in the Way She Moves. This entry was posted in Reviews, Uncategorized and tagged Roanoke Performing Arts Center, Willie Nelson by Teresa. Bookmark the permalink.